I am simultaneously a teacher and a biologist, an inextricably linked relationship. Why? Our species (Homo sapiens, literally translated to wise man) has a cultural heritage and historical precedent of passing information from one generation to the next. Learning during our youth and passing on knowledge, advice and experiences as we age is an innate part of what it means to be human. Being a teacher only grants me the opportunity to impact our future leaders on a larger scale. However, I like to think that I have approached this responsibility in a particularly effective manner, as supported by the literature—passing on this information through high impact practices and applied research, so that students may tangibly experience the theoretical biology components within the classroom. I am keenly aware of the significance of my job, equipping these young minds with the inter-disciplinary skills they need to succeed, and try to fulfill it with sincerity and dedication. My goals as a teacher is to educate the students in such a way that they are prepared to take up the challenges of the future. I take special efforts to prepare my lectures—updating my presentations continually; receiving fresh transfusions of ideas from my own ongoing research and recently published articles. Since my teaching focuses on Biomedical Sciences, an area of science in which discoveries occurs at a significant pace. Integrating research into my teaching helps students understand current scientific work. Learning developed theories and facts are important, but understanding ongoing work can be equally significant. I do this by developing skills like perception, analysis and expression. My assignments are designed such that I make students analyze and think logically by interpreting basic scientific experiments, which instills in them the appreciation of investigative science behind the diagrams of cellular and functional components of the cell. Furthermore, in the process, students are encouraged to interact not only with me, but also with their peers. I help the students to assume an active and creative relationship with their daily environment so that by the end of college, they are able identify and define the specifics of the problem and make proper judgments about the values and choice of their future career. I always try to instill in them the appreciation of investigative science, presentation abilities, improve their writing skills and help them to think beyond the classroom. I serve a diverse group of students of various ages, backgrounds and levels. Although the common principles apply to all levels of student, I recognize that students of different ages, backgrounds and levels are prepared to engage the course material in different ways. The younger generations of students who come straight from high school are ready to be molded in any form: they are curious but less attentive. Their primary goal is to develop cohesive arguments and learn to defend their position with logic. My goal as a mentor is to assess the strength and weaknesses of competing perspective and show them a path of success. The more mature group of students is ready to get started the first day. These students are able to generate their own original arguments and design their own way of study. This is the group that I apply different high impact practices to instill in them curiosity so that they can reach beyond their self-imposed limits. I am accessible both inside and outside the classroom, offering individual attention that helps me develop bonds with my students. Their feedback is also the most reliable measure of my efficacy, and interacting outside the classroom setting often gives me the opportunity to assess what I may need to improve. Teachers have great power and sway because they have great influence over students. Teaching, for me is not only my vocation but also my passion. I have proven my merits as a sincere and competent educator and look forward to improve myself every day to come. Indeed teaching is a noble profession. My major interest is focused on three chief issues in the interplay between Endocrinology and Neurobiology. First, changes in the estrogen receptors with senescence, second changes with obesity and third the action of estrogen in the glucose homeostasis and apoptosis of cell in tissues subjected to hypoglycemic conditions. T. R. Chakraborty, S. Chakraborty and N. Klimova (2016). Effect of endocrine disrupting chemicals on pregnancy. Endocrine Disrupting Chemicals: Occurrence, Exposures and Health Risks. New York, NY: Nova Science Publiser. T. R. Chakraborty, L.Donthireddy, D. Adhikary, and S. Chakraborty (2016), Long-term high fat diet has a profound effect on body weight, hormone levels and estrous cycle in mice. Medical Science Monitor, 22, 1601-1608. T. R. Chakraborty, E. Allecia, S. Chakraborty (2012), Relationships between urinary biomarkers of phytoestrogen, phthalates and phenols and pubertal stages in girls. Adolescent Health, Medicine and Therapeutics, 3, 17-26. K Y Ng, J. Yong and T.R. Chakraborty (2010), Estrous Cycle in ob/ob and ovariectomized female mice and its relation with estrogen and leptin. Physiology & Behavior, 12, 125-130. E. Watson, S. Fargali, H. Okamoto, M. Sadahiro , R.E. Gordon, T. Chakraborty, M.W. Sleeman, S.R. Salton . (2009), Analysis of knockout mice suggests a role for VGF in the control of fat storage and energy expenditure. BMC Physiology, 9(1), 19-23. J. Roy, S. Chakraborty, T. R. Chakraborty (2009), Estrogen-like endocrine disrupting chemical affecting puberty in humans- a review. Medical Science Monitor, 15(6), RA137-145. S. Chakraborty, A. Sachdev, S. R.J. Salton and T. R. Chakraborty (2008), Stereological Analysis of Estrogen Receptors Expression in the Hypothalamic Arcuate Nucleus of ob/ob and Agouti Mice. Brain Research, 1217, 86-95. Chakraborty, T.R. (2016). Pros and Cons of Active Learning. In American Society of Biochemistry and Molecular Biology. San Diego, CA. Chakraborty, S., Babu, S., Adhikary, D., and Chakraborty, T. R. (2016). Long term exposure of very high fat diet on energy intake, hormones, cellularity and morphology of tissue- a male rodent study. In American Society of Biochemistry and Molecular Biology. San Diego, CA. Miller, A., Wong, N., Chakraborty, S., Adhikary, D. and Chakraborty,T.R. (2015). Differential effect of high fat diet on male mice on energy intake, hormones, cellularity and morphology of tissue. In American Society of Biochemistry and Molecular Biology. Boston, MA. Alecea, E., Yohanan, D., Cohen, J., Addya, S., Chakraborty, S. and Chakraborty, T.R. (2012). Neuroprotection of estrogen on hypoglycemic attack is through AKT/GSK3beta; pathway. In American Society of Biochemistry and Molecular Biology. San Diego, CA. Yohanan, D., Cohen, J., Min, I., Addya, S., Chakraborty, S. and Chakraborty, T.R. (2011). Neuroprotection by estrogen on hypoglycemic injury on hypothalamic cells at the cellular and molecular level. In American Society of Biochemistry and Molecular Biology. Washington DC, MD. Ng, K.Y., Yong, J., and Chakraborty, T.R (2011). Effect of high fat diet on reproductive cycle. In American Society of Biochemistry and Molecular Biology. Washington DC, MD. Yong, J.P-W., Ng, K.Y. and Chakraborty, T.R. (2010). Are estrogen and leptin the sole factors affecting the estrous cycle of, ob/ob and ovariectomized mice? In American Society of Biochemistry and Molecular Biology. Anaheim, CA. Chakraborty, T.R., Chu, P., and Chakraborty, S. (2009). Effect of Atrazine on the Hypothalamic Cell Line. In American Society of Biochemistry and Molecular Biology Abstract. New Orleans, Lousiana. Loera, M., Chakraborty,T.R. (2009). Neuroprotective effect of estrogen on hypoglycemic injury in hypothalamic cells. In American Society of Biochemistry and Molecular Biology. New Orleans, Lousiana. Ng, K..Y, Yong, J.and Chakraborty,T.R. (2009). Effect of estrogen and leptin in the estrous cycle of ob/ob and ovariectomized mice? In American Society of Biochemistry and Molecular Biology. New Orleans, LA. Chakraborty, T. R. and Chakraborty, S (2008). What is the pathway by which estrogen promotes the neuroprotective effect on hypoglycemic injury in hypothalamic cell lines? In American Society of Biochemistry and Molecular Biology. San Diego. Loera M. and Chakraborty, T. R. (2008). Neuroprotective effect of estrogen on hypoglycemic injury in hypothalamic cells. In American Society of Biochemistry and Molecular Biology. San Diego. Rayani N, Sachdev A. and Chakraborty, T.R. (2008). Correlation of Estrous cycle with estrogen and leptin levels in ob/ob and Agouti mice. In American Society of Biochemistry and Molecular Biology. San Diego. Akhtar, A. and Chakraborty,T.R. (2007). Effect of estrogen, estrogen receptor and neuropeptides on feeding and reproduction. In Endocrine Society. Toronto. Chakraborty, T.R., and Chakraborty, S (2007). Estrogen receptors in obesity and their signaling pathways. In American Society of Biochemistry and Molecular Biology. Washington DC. Sachdev, A., and Chakraborty,T.R. (2007). Cross talk of leptin and estrogen in the neuronal circuits to affect reproduction and feeding circuits. In American Society of Biochemistry and Molecular Biology. Washington DC. 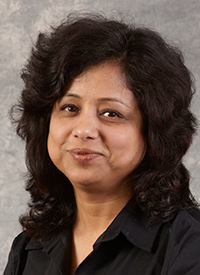 Tandra R. Chakraborty (2016, April). Pros and Cons of Active Learning. ASBMB, San Diego, CA. Tandra R. Chakraborty (2015, April). Pros and Cons of Active Learning. Adelphi Technology Conference, long Island, NY. Tandra R. Chakraborty and Deborah Cooperstein (2015, April). Strategies of Effective learning in Anatomy and Physiology Laboratory using iPad Applications. Adelphi Technology Conference, long Island, NY. Tandra R. Chakraborty (2013, December). Differential Effect of High fat on Body Weight, Hormones and Cellular Morphology on Male and Female Mice. Indian Science Congress. Invited foreign delegate to centenary celebration, Kolkata, WB, India. Tandra R. Chakraborty (2008, March). 'Obesity and Reproduction'. Stony Brook University. 'Adelphi Faculty Development Grant' 2007 and 2008. Lauren Kenna (2015). DNMT and diabetes. Adelphi University. Natalia Klinova (2014). Environmental Pollutants and Pregnancy. Adelphi University. Nicole Wong (2014). The differential effects of a Low Fat Diet and High Fat Diet on Female mice. Adelphi University. Laxinarasimha Reddy Donthireddy (2013). Effect of Very High Fat Diet on Hormone Levels and Body Weight in Female Mice. Adelphi University. Antony Delliturri (2013). Differences in the Effect of High Fat in Male and Female. Adelphi University. Sathyapriya Babu (2012). Effect of Very High Fat Diet on Hormone Levels and Body Weight in Male Mice. Adelphi University. Jonathan Roy (2010). Endocrine Disruptors. Adelphi University. Irene Min (2008). Neuroprotective effect of estrogen on hypoglycemia. Adelphi University. Theressa Eliscar (2012). Effect of Very High Fat on body weight, hormonal levels and Estrous cycle in Mice. Adelphi University. 2014-2015	Victoria Gomez, Trained in animal care, analysis techniques and light microscopy. Literature search, writing and presenting scientific papers. Co-author in manuscript submitted. Published an abstract at ASBMB 2015. 2015	Bridges Program, Alison Miller, writing and presenting scientific papers. Submitted an abstract at ASBMB. 2014	David Perrotto, Trained in cell culture, cryopreservation, immunocytochemistry, biochemical assays and light microscopy. Literature search, journal writing and presenting scientific papers. 2013-2014	Muntaha Hassain, Trained in animal care, analysis techniques and light microscopy. Literature search, writing and presenting scientific papers. Published an abstract at ASBMB 2015. 2013	Sara Hasmi, Literature review. Web search for scientific papers, journal writing and presenting scientific papers. 2013	Nicole Wong, Trained in animal care, analysis techniques and light microscopy. Literature search, journal writing and presenting scientific papers. Continued in the lab as a graduate student. 2010-2013	Eilliut Alicea, Published one full-length peer reviewed article in Molecular Medicine Reports. Trained in cell culture techniques, cryopreservation, immunocytochemistry, biochemical assays and light microscopy. Web search for scientific papers, journal writing and presenting scientific papers. Co-author in a full length article, two abstracts in ASBMB, presented at the CSTEP conference and at Adelphi University. Travel Award from ASBMB 2012. 2009-2012	Darien Yohannan, Published one full-length peer reviewed article in Molecular Medicine Reports. Trained in techniques like cell culture, cryopreservation, immunocytochemistry, biochemical assays and light microscopy. Web search for scientific papers, journal writing and presenting scientific papers. Published an abstract ASBMB and Adelphi University. He is the recipient of Travel Award from ASBMB 2011. Continued in the lab as a graduate student. 2009-2012	Joshua Cohen, Published one full-length peer reviewed article in Molecular Medicine Reports. Trained in techniques like cell culture, cryopreservation, immunocytochemistry, biochemical assays and light microscopy. Web search for scientific papers, journal writing and presenting scientific papers. Published an abstract ASBMB and another abstract at Adelphi University Research Conference. 2011-2012	Ahmed Eldib, Trained in animal care, animal use techniques, biochemical assays and light microscopy. Web search for scientific papers, journal writing and presenting scientific papers. Published an abstract ASBMB and presented at Adelphi University Research Conference. 2011-2012	Theressa L. Eliscar, Trained in animal care, animal use techniques, biochemical and light microscopy. Web search for scientific papers, journal writing and presenting scientific papers. Published an abstract in ASBMB, CSTEP conference and presented at Adelphi University Research Conference. 2011	Naruta Gurung, Scientific literature search, data interpretation, journal writing and presenting overarching thematic structures. 2008-2010	Jennifer Yong, Trained in techniques such as mice brain isolation, brain slicing, immunocytochemistry and light microscopy. Web search for scientific papers, journal writing and presenting scientific papers. Published one full length peer reviewed article in Physiology and Behavior 2010, two abstracts (ASBMB), two abstracts at Adelphi University. She was the recipient of the Travel Award from ASBMB 2010. 2008-2010	KaYan Ng, Trained in techniques such as mice brain isolation, brain slicing, antibody selection, immunocytochemistry and light microscopy. Web search for scientific papers, journal writing and presenting scientific papers. Published one full length peer reviewed article in Physiology and Behavior 2010, two abstracts (ASBMB), two abstracts at Adelphi University Research Conference. She was the recipient of the Travel Award from ASBMB 2009. 2007-2008	Jonathan Roy, Scientific literature search and data interpretation, writing and presenting the overall idea of the topic. Published one full length peer reviewed article in Medical Science Monitor 2009. 2007-2008	Atrish Akhtar, Trained to learn techniques such as mice brain isolation, brain slicing, selection of antibody, immunocytochemistry and light microscopy. Web search for scientific papers, journal writing and presenting scientific papers. 2006-2007	Aman Sachdev, Trained to learn techniques such as mice brain isolation, brain slicing, selection of antibody, immunocytochemistry, Immunoassay of hormones and light microscopy. Web search for scientific papers, journal writing and presenting scientific papers. Published one full length peer reviewed article in Brain research 2008, two abstracts at ASBMB and three abstracts at Adelphi University. He was the recipient of Travel Award from ASBMB 2007. 2007	Anna Mielczarek, Literature search and data analysis, journal writing and presenting the overall idea of the topic. 2016	Lauren Kenna, 1st Prize in the ARC Graduate Poster presentation. Manuscript in preparation. 2015	Nicole Wong, 1st Prize in the ARC Graduate Poster presentation. Published one abstract at ASBMB and Adelphi University Research Conference. 2014	Laxinarasimha Reddy Donthireddy, Co-author in a full-length peer-reviewed publication Medical Science Monitor, 2016. Published one abstract in Adelphi Research Conference and MACUB. 2014	Satyapriya Babu, Published one abstract in Adelphi Research Conference and MACUB. 2012/13 and at Adelphi University. Travel Award from ASBMB 2012. McDonald fellowship 2013. 2009	Jonathan Roy, Published a peer-reviewed article on ‘Estrogen like Endocrine disruptors affecting puberty’ in Medical Science Monitor 2008-2009. 2009	Irene Min, Published three abstracts in ASBMB. 2008	Melinda Loera, Published two abstracts in ASBMB. She received Minority Travel Award at ASBMB 2007-2008.